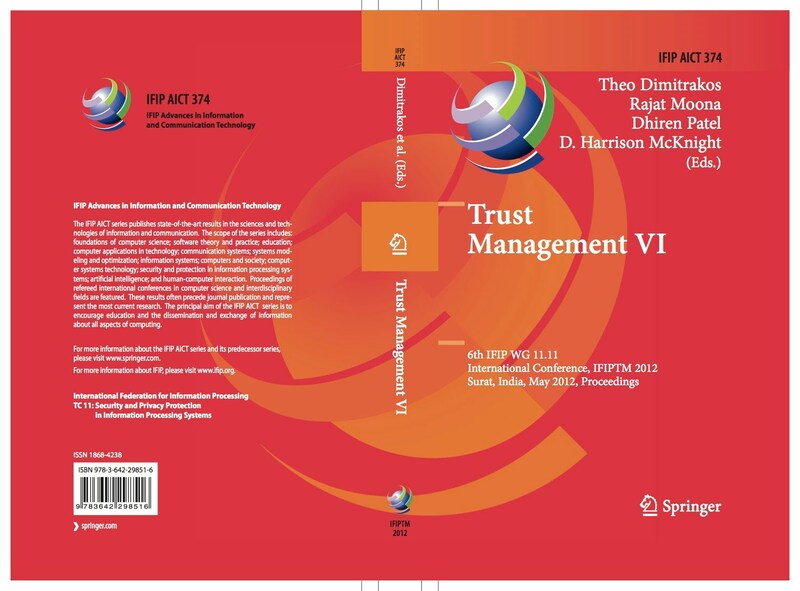 IFIPTM 2012 will be the 6th International Conference on Trust Management under the auspices of IFIP. The mission of the IFIPTM 2012 Conference is to share research solutions to problems of Trust and Trust management, and to identify new issues and directions for future research and development work. The goal of trust management in ICT infrastructures is to allow entities to reason about the trustworthiness of other entities and to make autonomous security decisions on the basis of trust. IFIPTM 2012 invites submissions presenting novel research on all topics related to Trust, Security and Privacy. Accepted papers will be published by Springer in the series of "IFIP Advances in Information and Communication Technology (AICT)" under the auspices of the IFIP WG 11.11 on Trust Management. More information on previous IFIPTM conferences is available at the following links. 5th IFIPTM 2011 in København, Denmark: http://s.ifiptm.org/conf2011. 4th IFIPTM 2010 in Iwate, Japan: http://s.ifiptm.org/conf2010. 3rd IFIPTM 2009 in Purdue, USA: http://s.ifiptm.org/conf2009. 2nd IFIPTM 2008 in Trøndheim, Norway: http://s.ifiptm.org/conf2008. 1st IFIPTM 2007 in New Brunswick, Canada: http://s.ifiptm.org/conf2007. We are soliciting proposals for the IFIPTM 2013. If you are interested in organising the IFIPTM 2013, please send us your proposal. You will find the proposal form at http://www.ifiptm.org/call-for-proposals.